The USAF Thunderbirds serves as the Air Force's Ambassadors in Blue to the American public as well as to audiences around the world who have witnessed their precision flying skills over the last 47 years. The Thunderbirds were formed in 1953 to provide a counterpart to the US Navy's Blue Angel demonstration team that started operations in 1946. Starting off in the straight-winged F-84G Thunderjet, performances were initially limited to the continental United States, then expanded to incorporate Central and South America. In the years since their stand-up, the USAF Thunderbirds have taken their show around the globe. Selection to a position on the Thunderbirds team is a rigorous process, and serving a season with the team was a serious boost to one's military career. Many notable officers served with the Thunderbirds including General Wilbur Creech who was in the first team in 1953 and would later rise to command the USAF Tactical Air Command. Colonel Jack Broughton who led the Thunderbirds through their transition from the F-84G through the F-84F and then the F-100C. Colonel Broughton would go on to serve as vice commander of the 355 TFW at Takhli RTAFB between 1966-67 before authoring the book 'Thud Ridge' documenting Washington's lack of will to win the very war that they were fighting. Before the Thunderbirds were established in 1953, the first USAF demonstration team was the short-lived Acrojets between 1949-1950 flying the F-80C Shooting Star before resources were redirected to the Korean War. Another demonstration team that predates the Thunderbirds is the USAFE Skyblazers who also stood up in 1949 and operated through 1962, performing across western Europe. 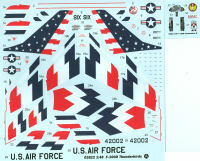 Trumpeter has re-issued its 1/48th scale F-100D kit, this time with two nice USAF demonstration team colors. 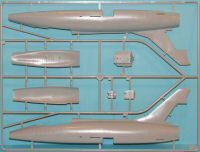 The plastic remains the same as the previous release, which means some of the 'bugs' in the design like the flat-bottomed intake are carried over, but all of the parts from the F-100D are provided including the two speed brake options and the various external stores options are included in the box so you can elect to build a combat veteran if you'd like. 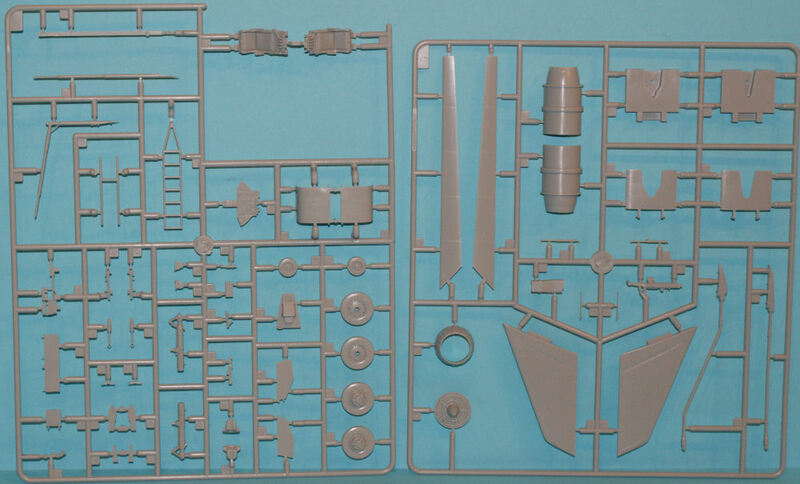 This kit does have one other interesting difference over the 1/32 F-100D kit - there is no engine face at the end of the duct in this kit. 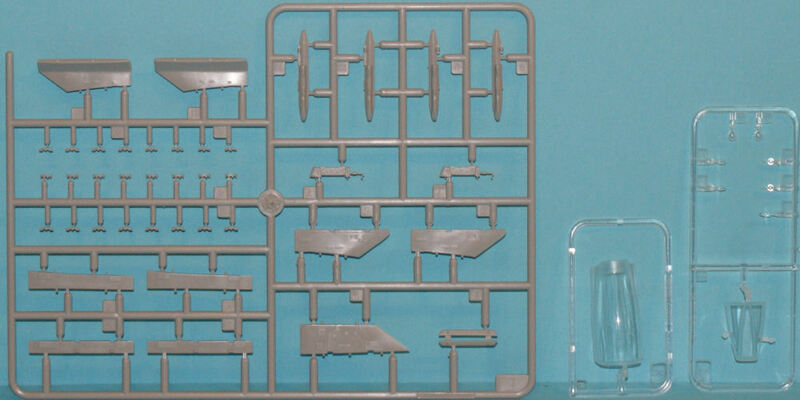 I'm happy to see that they didn't scale down that odd bit out of the 1/32 kit. 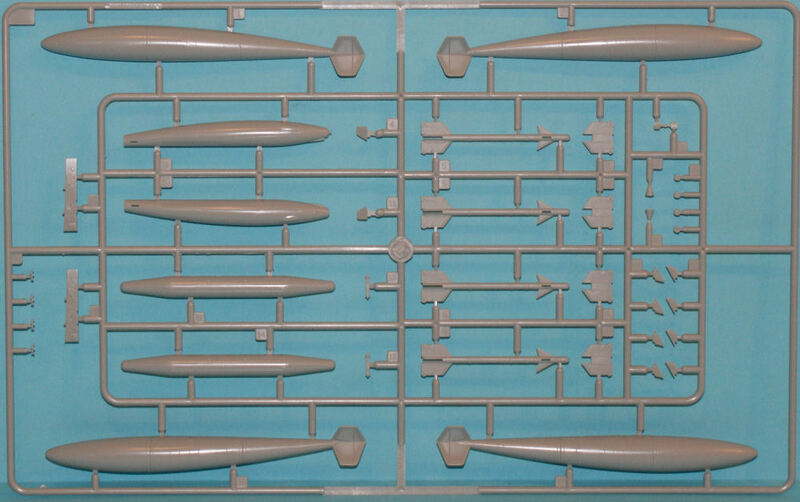 If you elect to build an airshow machine, you will get to put the various external stores and the nuclear-notched speed brake option into your spares box. The only time the T-Birds carried externals was when they were going cross-country to their next show and they needed the external tanks. One detail you'll need to add is a stretch of wire from the rear fuselage fairing out across the afterburner nozzle and into the edge of the exhaust exit. This was the smoke injector line used to enhance the show's visual impact. 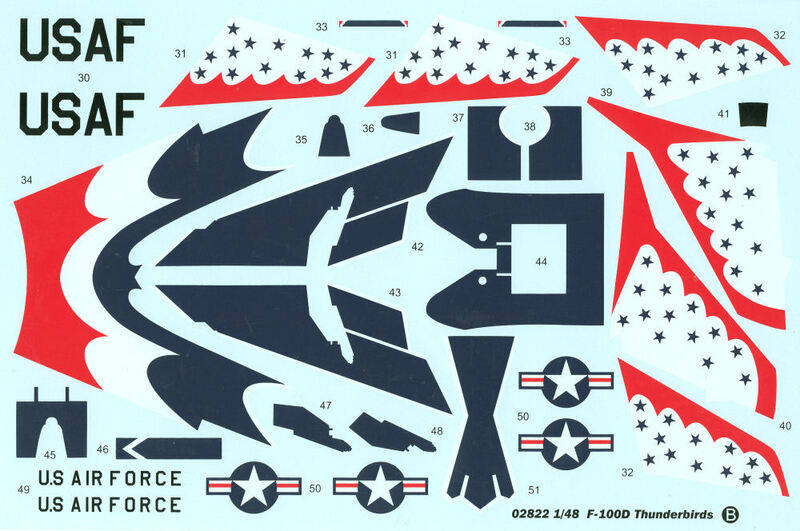 No, that isn't a typo - this kit provides markings for the USAFE Skyblazers demonstration team but the serial number provided is for an F-100C which the Skyblazers did fly (so did the Thunderbirds). 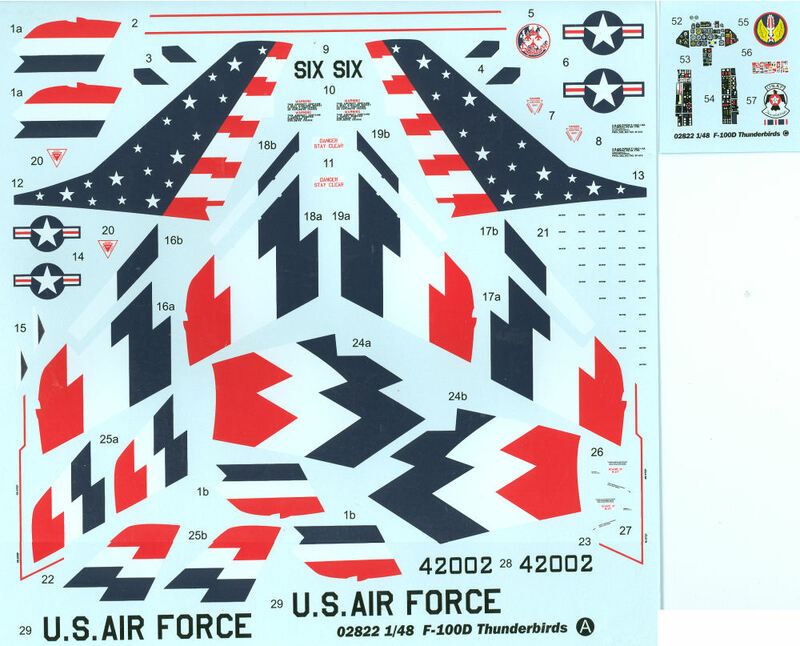 If you have one of the Trumpeter F-100C kits, you might consider using these Skyblazer markings on that kit and do the Thunderbird with this kit. Other than that little detail, these markings are nicely done. 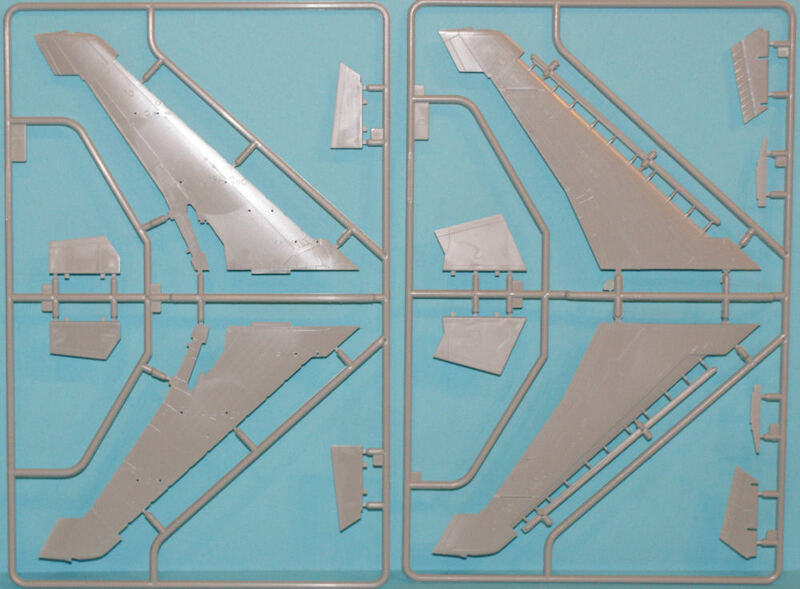 Trumpeter has released almost all of its Hun variants in 1/32, 1/48, and 1/72 scale. 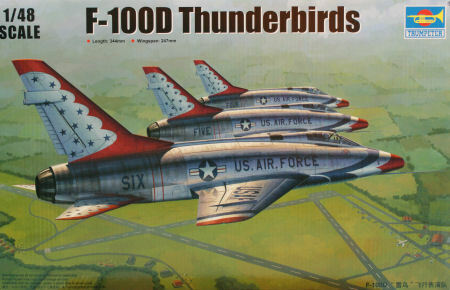 The only one missing is the very one many of us are looking forward to - the F-100F in 1/32nd scale. 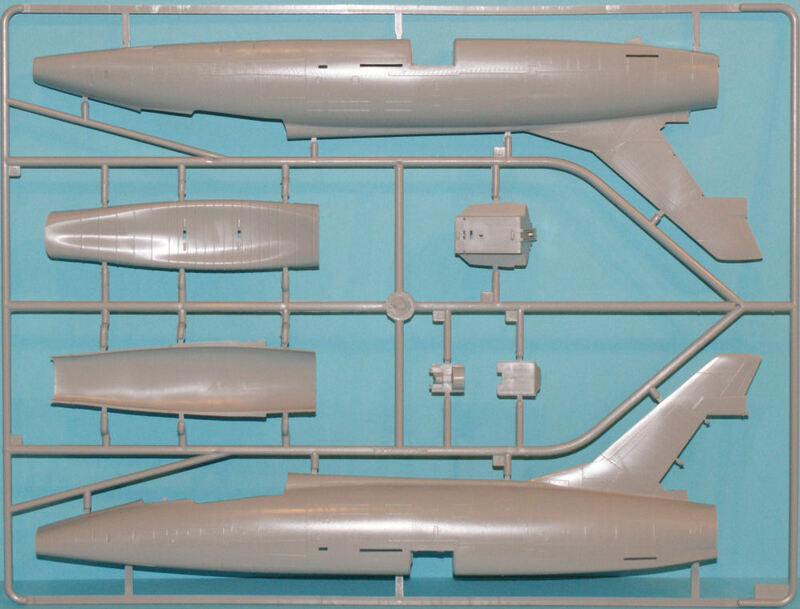 The opportunity to build a Misty FAC or 'Vampire' (Wild Weasel) is still high on the list of projects and I certainly hope Trumpeter will release that final chapter. In the meantime, here is a nice opportunity to build one (or more) colorful air demonstration team aircraft in classic colors.